The Jayco Jay Feather X213 comes standard with numerous premium construction features like crown molding and screwed-and-glued cabinetry on the inside and the TuffShell(TM) vacuum-bonded, laminated floor and walls as well as the Magnum Truss™ Roof system. This Travel Trailer also has a great kitchen and residential style furnishings making entertaining a blast. When it’s time for bed, kids or guests will love the spacious bunks up front and parents can stretch out in a king size bed in the rear of the camper. The Crossroads RV Zinger Z-1 model ZR272BH is over 30 feet long, and with its slideout dinette and sofa, you won’t want for more room in this bad boy. Up front you will find a queen size bed; however, it is the rear that makes this bunkhouse Travel Trailer so awesome. There you will find large 50” x 74” bunks where all it takes is a flashlight and some imagination to insure your kids dream about all of the adventures that await them. The Forest River RV Salem Hemisphere Hyper-Lyte 29BHHL offers a return on investment through better fuel economy when towing thanks to its special wind resistant design. This bunkhouse Travel Trailer has a jumbo dinette, a queen bed for Mom and Dad in the front, and oversized bunks in the rear. The kitchen is more than capable of feeding a hungry family after a long day at the lake, and the 16’ awning will keep you cool in its shade. The Keystone RV Passport 175BH Ultra Lite Travel Trailer can be towed easily with smaller trucks and SUVs, which is a feature that is hard to find in a bunkhouse Travel Trailer. It may be light weight, but it still has everything you need to feel right at home from the kitchen to the bathroom. 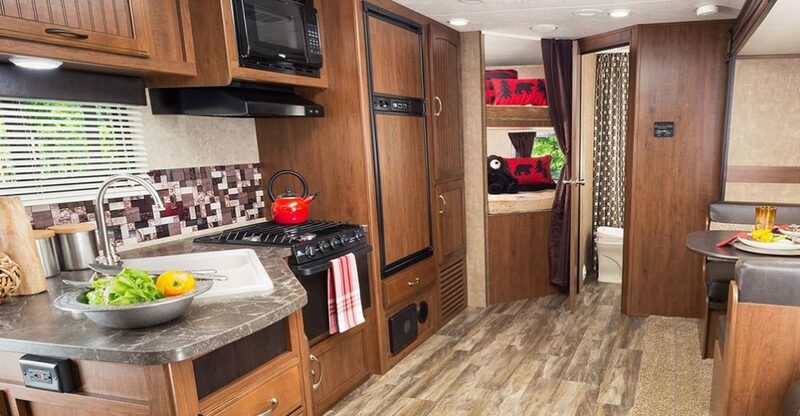 The Keystone RV Passport 175BH sleeps five comfortably while maximizing space through fantastic design features. The Starcraft Autumn Ridge 289BHS bunkhouse Travel Trailer sleeps 9 to 10 people and has a Double-over-Double bunk bed with a 600lb capacity. With an MSRP of less than $26,000, the Starcraft Autumn Ridge 289BHS is a great value for your money. It is loaded with fantastic standard features like Sandalwood Maple cabinetry, a trifold sofa, and a porcelain toilet with foot flush.